One of the most challenging components of healthy living is the sheer volume of numbers and formulas you’ll need to crunch in order to work out your ideal weight, body composition, daily caloric intake, temperature, and sleep efficiency. Thankfully, instead of having to work all of this out by hand, there are now an incredible number of accessories available for iOS devices that do all of the work for you! Why Is Digital Health Information Important? It might seem strange to transition to digital health tracking, especially if you are someone who takes a pen and paper approach to record keeping. 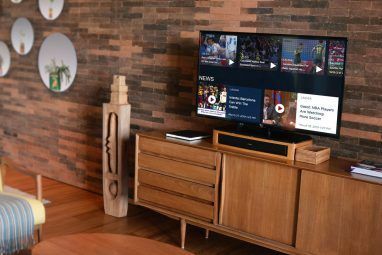 However, there are several reasons to consider making the switch to these devices. 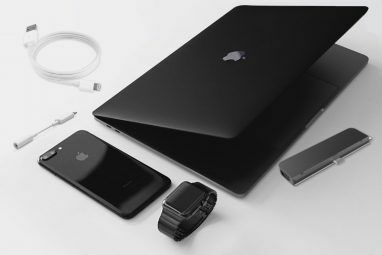 Firstly, all devices mentioned on this list are linked to Apple’s iOS 8 Health app iOS 8 Turns Your iPhone Into A Personal Healthcare Monitor iOS 8 Turns Your iPhone Into A Personal Healthcare Monitor Apple's new watch will turn your iPhone into a revolutionary device for managing your health and fitness – here's how it works. Read More . This means that all of your information will be stored in one central location in a single format. This information can be accessed via any of your iOS devices, so you have access to your health information literally anywhere you go. Best of all, this information can be integrated with iOS health and fitness apps you already use (such as MyFitnessPal or MapMyRun) in order to improve their effectiveness and to target your individual needs. Finally, the Health app displays your health information in a way that makes it easy to identify trends in your statistics, and serves as a fantastic way to keep your health care professionals in the loop about what your day-to-day health looks like. It’s the future of healthcare! 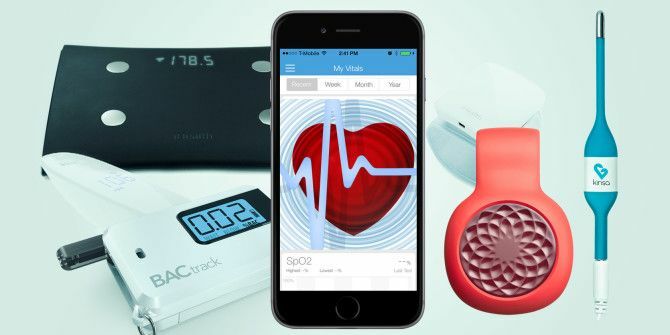 We’ve taken the time to round-up ten of our favourite health-tracking devices that integrate with your iPhone, iPad or iPod Touch. The iHealth Wireless Body Analysis scale does far more than just measure your weight. Four electronic sensors work in combination with well-tested algorithms to calculate your body composition (including muscle mass and body fat percentage), body water, bone mass, and an estimate of the number of calories you should consume in the next 24 hours to maintain your current weight. All the information gathered by the iHealth scale is sent by Bluetooth or Wi-Fi to devices synced with your iHealth account and viewed from any iHealth-compatible iOS device. The scale can be used by up to twenty separate users at a time. Maintaining a healthy weight is a key component of a healthy lifestyle, as being overweight or obese is a risk factor for a number of chronic health conditions including heart disease, diabetes, and strokes. The iHealth scale goes above and beyond by also providing key measurements (such as body composition information) to help users pinpoint whether or not their current weight, body fat percentage, and muscle mass is placing them at an increased risk of developing health problems. The price comes in at $99.95 for the Wireless Body Analysis Scale, and the iHealth lite (which only measures and syncs information about your weight) is $79.95. iHealth Glucometers (such as the incredibly portable iHealth Align or the wireless Smart Gluco-Monitoring System) help people with diabetes to track their blood sugar throughout the day and help indicate the proper dosage of insulin that they require at a given point in time. The iHealth Align is slightly bigger than a quarter, but is an FDA-approved method of syncing blood sugar information directly with your iOS device. The Smart Gluco-Monitoring system can operate independently of your iOS device, but can also sync information to your iHealth database through Bluetooth. Having accessible, digital information about your blood sugar is especially useful to those who have diabetes, and can help in the day-to-day management of the disease. The holistic approach taken by the iHealth system allows users to quickly add information about their diet and medications to their blood sugar logbook, allowing for the easy identification of trends and the factors that cause them. The iHealth Align is only $16.95, and the Smart Gluco-Monitoring System is only slightly more at $29.95. iHealth test strips are sold separately. Devices like the Jawbone fitness tracker track the number of steps you take, the amount of time you spend being active, the calories you burn, and the distance you travel over a 24-hour period. This information can all be synced through Apple’s Health app — surprising, given that several months ago Apple actually pulled all other fitness tracker brands from their retail stores. Not only is staying active good for your physical health, but walking improves your brain health Use These 5 Apps to Walk More and Improve Brain Health Use These 5 Apps to Walk More and Improve Brain Health We are all desperately searching for ways to improve our brain function -- but it might be as simple as going for a walk around the block! Read More as well! Having a device that keeps track of your activity level can be incredibly inspiring — whether you’re competing against your friends, or just against yourself. There is an argument to be made against these devices, as the iPhone 5s and above all have a native pedometer-type accelerometer. However, external activity monitors can be worn without having your phone on you. These devices are also required if you don’t have an iPhone 5S or higher, and some believe that their tracking is actually more accurate. The Jawbone fitness trackers come in several different models – the base model (the Jawbone UPmove) comes in at $59.99, and the most expensive (the Jawbone UP3) is the slightly-pricier $199.99. The iHealth blood pressure monitors allow you to take simple, accurate blood pressure readings at home. These FDA-approved blood pressure monitors are wireless, and all information can easily be synced with your iOS Health app. The iHealth Wireless Wrist Monitor saves you from having to figure out the perfect placement for your blood pressure monitor on your upper arm, and instead gathers an accurate reading from your wrist. The Wireless Blood Pressure Monitor, however, requires the classic position to work. Being aware of trends in your blood pressure is a great way to stay aware of any changes caused by altered medication, stress levels, or related medical conditions. Having blood pressure that is too high or too low can be a risk factor for many chronic medical conditions, so recognizing an upward trend in your blood pressure early is a great way to look for an intervention before things get worse. The iHealth Wrist Monitor is $79.95, and the classic iHealth wireless blood pressure monitor is $99.95. It’s amazing how important a good night’s sleep is! Unfortunately, improving your sleep quality (or even having an unbiased opinion of how severe your sleep problems are) can be incredibly difficult. Enter Beddit, a tiny sensor that is taped to your mattress under your fitted sheet. Beddit gives you a comprehensive score of your sleep quality, but also breaks down your sleep habits by the number of sleep cycles you achieve, how many times you wake up during the night, whether or not you snore, and your heart rate. Beddit also provides a “smart alarm” that helps you to wake up at the optimal time based on your current sleep cycle. Sleep is key to our health and well-being How Can Sleep Help You Become More Successful? How Can Sleep Help You Become More Successful? Read More because of its restorative properties. If you aren’t getting good quality sleep, you may find that you have difficulty maintaining a healthy weight, dealing with stress, eating healthily, or keeping your blood pressure in an acceptable range. By being conscious of your sleep habits and the reasons behind any sleep difficulties you are having, you will be able to change your sleep hygiene and improve the amount of restorative sleep you actually get. The classic Beddit model is $119, but the new Beddit Sleep Monitor Smart allows you to track your sleep without requiring the mobile app to be open at the same time for $149. Wahoo Tickr Heart Rate Monitors not only track your heart rate while you exercise but also use the information they gather in real time to keep your exercise intensity level exactly where you want it for your individual fitness needs. The monitors are sweat-proof and water resistant, and can monitor your heart rate no matter your exercise intensity level — whether it’s the lightest of jogs or the most strenuous of marathons. Not only are the Tickr Heart Rate Monitors compatible with Apple’s Health app, they can also be synced with over 50 other health and fitness apps The Best Health and Fitness Apps by Runtastic Put to the Test The Best Health and Fitness Apps by Runtastic Put to the Test Runtastic, the makers of one of the best fitness apps for Android, also have a lot of other apps. We take a look at all of them to see if they're worth your time. Read More such as Runkeeper and MapMyFitness. Your heart rate is an incredibly important measurement when it comes to awareness of your cardiovascular health. A large part of improving cardiovascular fitness and fat loss involves performing aerobic exercise within a target heart rate (where your heart is pumping hard enough to be a challenged, but not so hard that you end up hurting yourself). Having a heart rate monitor takes all of the guess work and math out of finding this ideal training range, and lets you focus on your workout instead. The base model Wahoo Tickr Heart Rate Monitor is $59.95, but it has to be used in conjunction with your iPhone for tracking and immediate feedback. The Wahoo Tickr X, however, has up to sixteen hours of storage for your workout information — so you can leave your iPhone at home and sync the information later. Kinsa thermometers are simple, but wonderfully so. 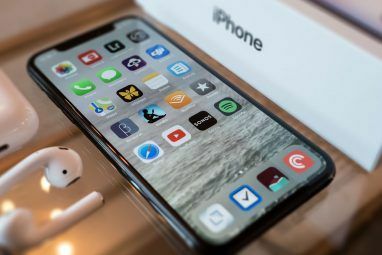 The first smartphone-connected thermometer to be approved by the FDA connects to your iOS device through the headphone jack, and gives a clear digital readout of your temperature (which can be taken orally, rectally, or under-the-arm). Fun loading screens can help to distract children (or adults!) who find sitting still for temperatures difficult, no batteries are required, and the data is synced both to Kinsa’s native app and to the Health app for accurate record keeping and easy monitoring of temperature trends. The humble thermometer is likely one of the simplest healthcare devices out there, but also one of the most important. Being able to monitor your body temperature is a great way to stay aware of the severity of any illnesses that you (or your children) may have, and being able to present accurate and recorded information to a physician could be incredibly helpful when it’s time for them to come up with a diagnosis. The Kinsa thermometer costs only $29.99 and is advertised as one of the most durable thermometers around – definitely a competitive alternative to classic thermometers! BACtrack breathalyzers are portable breathalyzers that give you a quick and accurate estimate of your current blood alcohol content, as well as an explanation of what the number displayed means and an estimate of what time your blood alcohol level should return to zero. This data can be synced with your Health app so that you can see how factors like sleep and diet influence (and are influenced by) your level of intoxication. Intoxicated driving is a serious threat to health — both your own, and that of others. By being responsible and using a portable breathalyzer at a party or social function before getting in the car (or allowing guests to start their drive home) you are increasing road safety for everyone. The basic BACtrack Vio breathalyzer is small enough to fit on a keychain, and costs $49.99. The slighly more expensive $99.99 BACtrack Mobile Pro features a rechargeable battery and a more accurate sensor. The iHealth Wireless Pulse Oximeter is a fast way to check your blood oxygen level and heart rate when you’re on-the-go. This information can be synced to your Health app on iOS devices. Both your pulse and your blood oxygen level are important measurements when it comes to tracking your overall health and athletic capabilities. This is especially important for athletes who compete at high altitudes and who need to be aware of the changing blood oxygen conditions that occur at these elevations. The iHealth Wireless Pulse Oximeter can currently be purchased for $69.95. There is an incredible variety of health devices and internet-connected home fitness products 6 Coolest Home Fitness Products That Talk to the Internet 6 Coolest Home Fitness Products That Talk to the Internet While wrist-mounted fitness trackers have been around for a while, you'll soon see new fitness devices that talk to the Internet to stay motivated, track progress, and help you improve your fitness habits. Read More that are targeted at a single sport (or towards a single aspect of a sport), including soccer, baseball, golf, and cycling. These devices can help athletes train for their preferred sport with in-depth analytics of their golf swing, soccer skills, or cycling habits. Browsing the Apple Store’s selection of sport-specific devices shows a wide range of options with an equally diverse set of prices. With that being said, however, be prepared for most devices to set you back a pretty penny — athletic excellence doesn’t come cheap! Now, more than ever before, your health is truly in your hands. With this kind of technology and the amazing range of health and wellness apps An Apple a Day: The Best iPhone Health & Wellness Apps An Apple a Day: The Best iPhone Health & Wellness Apps No mobile app is a good substitute for regular, in-person medical exams or emergency medical attention, but they still have their uses. Read More available, there is really very little excuse for not having an understanding of your health and working to maintain or improve your daily habits. By observing this data in isolation, we might not know much other than our heart rate at a single point in time. However, the beauty of iHealth and associated devices is that you are given the opportunity to view your health holistically over time, providing the data you need to guide you as your health changes over time. These products are also incredible resources for doctors – instead of relying on a single reading at an appointment, they can observe trends in your health that have occurred since your last appointment, and teach you how to best interpret your data for your individual healthcare needs. The key thing to remember is that there is no benefit to having this holistic image of your health if you don’t do anything with it — use the data as a way to improve or maintain your health instead of just collecting it out of curiosity! Do you have any iHealth devices? Have they influenced your daily habits? Explore more about: Fitness, Health, iPad, iPhone, Sports. "For iHypocondriacs"? Then, why did you write this article in the first place? Or, is it some sort of humor that I don't get? I can never understand why some apps are so expensive. Which is better 1000 sales at $100 each or 1,000,000 at $1.50. Cheap apps will always sell because for the sake of a dollar or 2 it doesn't matter if the app is not quite right for my needs, but I need to try it out to find that out for myself. Apple apps are particularly prone to being expensive.